From the top of Ofen Pass in eastern Switzerland it was almost an entirely downhill ride into a finger of northern Italy and the small town of Mals, our intended stop for the night. We did park near the border at Müstair, Switzerland for a look at some faded Carolingian frescoes from about 800 ce in the convent of St John the Baptist and threaded our way through the 1500's wood-paneled rooms of the old stone cloisters before leaving the country. But we need not have slowed at the border as the guard talking on his cell phone didn't even bother to wave us through but instead ignored us altogether. The ride into Mals would have been effortless had it not been for the intense heat and the endless field cutting that filled the air with invisible bits that played havoc with Bill's nose. Bill was most pre-occupied with his nose and I with the waves of hot air that rolled up the valley to meet us. The mid-90's temperatures slowed our progress up small rises in the villages like we were doing sustained 12% grades except that we had to stop more often to recover. We poured water on our heads and splashed it on each other as in disbelief we struggled to make the last couple of miles. The expected 2200' climb up the pass had turned into 3300' before we were done but it was the heat at the end of the day, not the climbing, that turned us into zombies that evening. Not many Tyrols decorate this intensely. That afternoon I took my turn at suffering from what we termed "Mountain Fatigue" whereas Bill had had his bout in Switzerland. We are still baffled as to what is amiss when it strikes, but it seems to be a generalized system overload that results from too much climbing exertion in the heat. As when it happened to him, being attentive to caloric, fluid and salt intake, and completely cooling down, didn't resolve it. The only remedy seemed to be hours of rest. Despite the unwelcome sizzling reception, we were thrilled to be back in Italy. As expected, lodging and food prices plummeted and we celebrated with a cheaper but nicer room and a pile of fresh fruit and vegetables for a mere $4. Our withered bodies and the promise of a continuation of the string of days in the 90's made a layover day a no-brainer. We were in no condition to set the pace needed to eat, bath and do our evening chores and then prepare for an early departure in the 4 hours remaining before calling it a day. Our room temperature only dropped to 80° at bedtime and we wondered if we'd sleep at all. The threatening thunderstorm only delivered a single flash of lightening and instead of clearing the air with rain, overcast skies raised the humidity and held in the heat. We stashed away the feather comforters, propped open the balcony window and door, and hoped that the bar noise and neighborhood lights wouldn't keep us awake with our wide-open room. My handy eye covers would help especially with the early morning light. Refreshed with an unexpectedly good night's sleep, we confronted the next morning's heat on foot. The sapping effect of the mid-morning temperatures were impressive as we strolled to do our shopping. "Maybe 7:30am departures wouldn't be early enough, maybe riding 'til noon on the hot days was too optimistic" we heard ourselves saying. We felt quite comfortable sitting motionless in our room with the window and doors open but wondered how we would make our way east towards Bolzano, which at an even lower altitude, was expecting temperatures in the high 90's. It was so hot in Bolzano that our dark chocolate bar turned to syrup sitting in our room; the olive oil sloshed as effortlessly in the bottle as water; and several products in tubes began oozing out of unknown places. Not only were we wilting in our room at night with the temperature in the mid 80's despite the breeze, but we had unexpected messes to clean up from our heat-stressed belongings. Amazingly, even with our 9:30 pm bedtime that was just about at sundown, we did manage to sleep each night during the heat wave. In Bolzano our south facing room had a rare portable fan and like in other towns Bill, took care to select rooms with good ventilation opportunities. We no longer indulged in the pleasant darkening effects of curtains but instead slept with the windows as open to air flow as possible all night long. At times in the night we'd awaken and open our door for a few minutes for the increased fresh air and perhaps splash cool water on our bodies for some extra relief. 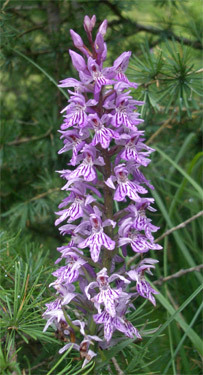 Wild flowers high in the Dolomites. Aside from the inconveniences of the heat wave, we enjoyed our brief time in Bolzano. It is an ardently bike friendly city of about 100,000. The 60 mile bike route from the Swiss border was essentially completed and we traveled on dedicated bike paths much of the way into town. The city is crisscrossed with out-of-traffic bike lanes and bike racks in town stow dozens of bikes at a time. In the center of the old town near the train station is a city-sponsored bike rental kiosk with 100 red, 1-speed bikes neatly lined up. Each bike has a bell, a lock, a basket and fenders and can be rented for 6 hours or less for $1.20. The price doubles to keep it over 6 hours--still an incredible price. Bolzano is one of a handful of cities we keep visiting because they are natural crossroads. Bolzano is a gateway to the Alps and affords some striking views of distinctive mountain tops. It's offers good bus and train service into the region and has sophisticated enough stores to be a good restocking point. It was here that we bought many of the things we postponed purchasing while in Switzerland because of their high prices, things like toothbrushes and batteries. Bill found a new saddle that looked like it would be more comfortable for his chronically saddle-weary bottom and we bought heavier duty ponchos to make up for the shortcomings of our almost water proof jackets. I raided the street market, hauling back 12 lbs of produce, almost all of which was running about $1/lb. We delighted ourselves by indulging in the cherries, peaches, apricots, tomatoes and apples over the next couple of days. Unfortunately the bike route out of town in our direction was in the active construction stage and we could only admire how wonderful it will soon be. Perhaps on visit #5 to Bolzano we'll be able to enjoy the dandy new route on an abandoned rail line but this time we still had to mix it up with the trucks as we headed deep into the Italian Alps, the Dolomiti. The view out our budget room in Selva. The mountain gods were teasing us. 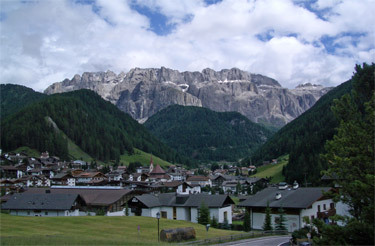 The village of Selva was so stunning with its surrounding dolomite peaks that I suggested we stay a second night. We'd been frustrated earlier in the day with our cable car up to 7800' from the town of St Ulrich because the lighting wasn't right for the photos we longed for. The late afternoon would have been better but we feared that the clouds would roll in by then so we headed out. Here in Selva great shots of the Sella Group and other peaks could be had from town. I imagined spending the next day strolling to different corners of the village as the light was at its best on the various peaks: the peaks dramatically illuminated in the morning light would be shot then and the afternoon would be reserved for the others that looked their best later in the day. But we awoke to a view-obscuring low overcast and unrepentant rain which decimated my first-ever day designed just for taking photos. The stormy skies also prevented us from locating the 1 kilometer tall vertical face (a little over 6/10ths of a mile) that was out there somewhere in the murk. We bundled up for a test walk in our new cycling ponchos and headed up a scenic valley until the skies cleared. We'd seen the dramatic postcard images of the sheer pink dolomite walls but could only imagine them as we saw little through the heavy clouds. Fortunately Bill had suggested buying a couple of small wild flower field guides that he spotted in English so we peered down at the little blooms in the grasses instead up at the hidden crags and spires. But we walked all morning and into the afternoon in the rain, with the skies only improving very late. Of course it was wonderful that the rain actually stopped, but we were limited to the same afternoon lighting for photos as when we arrived the day before. We decided to use the next day's better weather for crossing the next mountain pass rather than lingering longer for the illusive photos. Spending several nights in the Val Gardena opened my eyes to another side of the Dolomites--how to enjoy them from more of a resort-based experience than from a bike. The Dolomites cover a small enough area that you can too quickly drive through them in a car but if you choose to linger a bit, there are many ways to savor the experience. The area can be experienced by the big wheels on one of the many local buses or smaller wheels of a motorcycle or bike. We spoke with a UK couple who booked a room for 2 weeks and spent the better part of everyday on the many marked hiking trails for a range of abilities. Dozens of cable cars will take you to the 7,000' to 10,000' level of peaks and passes to support a range of activities. We saw a few cable cars that were wheel chair accessible and we've seen more than one used by hang gliders to reach launching points. Some people just ride up to the top and admire the view from the platform and perhaps have lunch at the restaurant. Other people use the ride up as a starting point for a single day or many days of hiking. 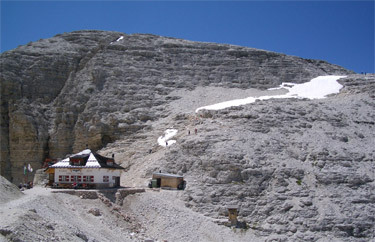 There is a system of huts to lodge long distance hikers and a few modest hotels for the less adventurous a short walk from some of the cable cars. Unlike Switzerland, the cable cars are affordably priced, ranging from $10-20 per round trip. Bill noticed that Val Gardena has a special weekly pass for about $65 that allows unlimited use of all of the cable cars in the valley, which was probably a dozen or more. These ski area towns have exploited their resources to provide a host of summer time activities. Tennis courts, swimming pools, horse back riding, and guided nature walks abound. A new one to us was tandem hang gliding so that those with no experience can hire a ride on the drafts with a pro. And some hotels host several day trips a week to places like Venice and Verona. It was easy to imagine a family spending a week or 2 in one town and being able to satisfy every family member's passions for a vacation, with some enjoying an active and adventurous holiday and others working on their tan while reading a book and looking up at the stunning mountain views. Bill just past the summit of Passo di Sella.. The lodging options and prices range from the simple no-star places like we stayed at for around $50/night for 2 up to 5 star hotels. Many offer package deals that include meals. For more information about traveling in this area, go to the "Country Details" sidebar on the left side of our website homepage and open "Italy - Northern" (or click on the link here Italy - Northern). Though we grumble and curse unexpected steep slopes and are often pushed closer to our edges than we would choose, we come to the Dolomites and the Alps to climb up the many steep passes. It is the time in the mountains that we savor and it is those times that are the most vivid and treasured in our memory banks. 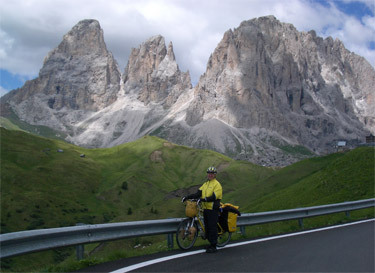 For us, the equation reads: "The best of cycling in Europe = Cycling in the Dolomites." (Though the TV coverage we saw of the Pyrenees in this year's Tour de France has us reconsidering our less favorable opinion of those mountains.) And so we began the parade of passes, with the next being Passo di Sella. What a view for our picnic off the Passo di Sella summit. It wasn't long and we fell in love with this new pass. Passo di Sella was definitely challenging but not as difficult a climb as some and still delivered incredible views on the way up and part way down. When at the top we learned that the unusually high number of cyclists on the road were there in advance of a grueling annual bike race the next day. Many cyclists parked at the top checked out our equipment and one correctly guessed that in all of our gear that Bill had the right tool to tighten his shoe cleats. The crowds were fun but the picnicking opportunities at the summit weren't up to our usual high standards. We however lingered long enough for some other visitors to pose in front of our bikes for their own photo with our "Barcelona to Istanbul" sign. It seemed like a great spoof and we were surprised no one had done it before. When we had all finished our photo-taking and the other fellow's shoe hardware was snugged-up, we had our celebratory lunch at a choice spot a few switchbacks down the other side. 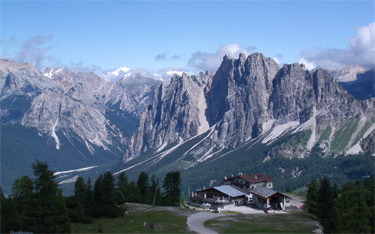 The road over Passo di Sella, one of several passes ringing the Sella Group of peaks, dropped us into the resort town of Canazei. The next morning we left the bikes behind and took a series of cable cars and a short hike to reach Passo Pordoi on a day that the area's roads were closed for the bike race. After taking a final cable car from the pass to the top of one of the peaks in the Sella Group, we and many others set out for a long hike on a gorgeous day. When we were at the top of the cable car at Passo de Pordoi in 2003 it was all but socked in. We ventured out of the observation area for a quick look and to snap a photo in the relative breaks in the swirling fog and rain. This year couldn't have been more different than 2003 as the sky was a brilliant blue. The changing winds dictated whether we needed jackets or not but the bright sun was uninterrupted. 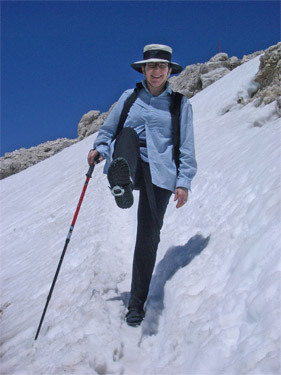 We traversed the loose rocks and occasional patches of snow with our hiking sticks and Ice Walkers strapped to our Teva sandals--both of which were great aids to keeping us upright. It was one of those exquisite days in the Dolomiti that keep us coming back. The feast of details for the eyes and the grandeur of the many peaks is captivating. But like pedaling down from a pass, it was hard to take the cable cars back down to Canazei and distance ourselves from the drama of being eye level with the phenomenal peaks. However as long as we were in the Dolomites, we knew that there would be more to come. "Ice Walker" mini-crampons on my sandals. Next, was another new pass, Passo di Fedaia at 6700', with its 18% grades on our downhill side. (Yo, Map Man!) Then it was on to a beautiful reunion ride up over Passo di Falzarego at just under 7,000' into the ski resort of Cortina d'Ampezzo As we often do as we approach the upper reaches of a high pass, we stopped every 200 to 500 yards to catch our breath and re-gather our strength to complete the climb. The blue skies and just warm enough temperature invited a leisurely lunch at another carefully chosen picnic site at the picturesque top. We were in no hurry to leave the stunning sight of 360° panorama of mountain peaks. Reluctantly we prepared for our descent that would end in Cortina 12 miles away. But as happens at the best of these passes, our initial descent was as slow as the last couple of our miles up the other side with the many stops being a feeble attempt to saturate ourselves with the sights. The dramatic chiseled peaks and faces revealed different nuances of their many looks as we twisted and turned down the numerous switch backs. Some peaks had rosy and beige tones dusted with the powder of almost pure white pulverized rock whereas others had a predominantly gray tone with black streaks. Our cable car ride up from Cortina village 2 days later afforded more looks at the imposing Sella Group and Marmolata, the highest peak in the Dolomites. 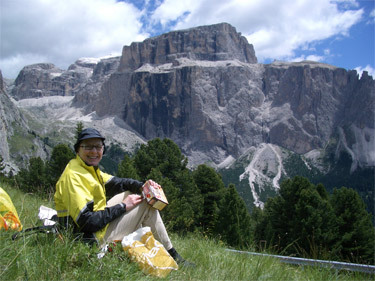 Previously we'd been in Cortina too early in the summer season to enjoy the ride up and hiking possibilities. And once again this summer we found ourselves making an unexpected layover to sit out extreme weather--this time it was some ferocious thunderstorms accompanied by some of the heaviest downpours we'd ever seen (fortunately from the safety and comfort of our room). It finally cleared as we hiked down to the cable car to Cortina. The Dolomites are loaded with 'memory pods' for us: "that's where a pannier fell off; that's the place we stayed with the kitchenette; there is a nice grocery store over there; that's where we spoke with the sisters from Germany: this is where the bike route was still under construction and we got turned around." In a lifestyle that continuously has us in new places, it is fun contrast to revisit a place where so many memories are revived. Reluctantly we said our good-byes to the fabulous Dolomiti mountains and the northern Italian culture we so enjoy. It's a double whammy as in a matter of 20 miles upon leaving Cortina, it's all behind us, both Italy and the mountains. All too quickly we cross the no longer demarked border between Italy and Austria and are admiring low, tree covered hills and lush pasture land instead of barren, chiseled peaks. Bill tallied our elevation gain from the day we entered the Alps in Switzerland on our way over Simplon Pass on June 9th until we exited into Austria on July 9th and discovered we'd logged 44,472' in elevation gain or almost 8.4 miles of "up." In 2003 in the same amount of time we did close to 10 miles in elevation gain. Neither year was a contest and both times we were just doing what we wanted to do but it was interesting to compare the efforts. In 2003 I was fried by the time we left the mountains. Bill had one more pass in mind and I waved the white flag as I just didn't think I had it in me. This year we intentionally took more days off and left the mountains feeling strong and rested--a pleasant contrast to 2003. 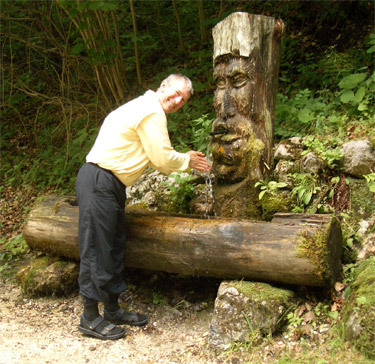 Traditional woodcrafts are alive and well in Tyrol and vicinity. 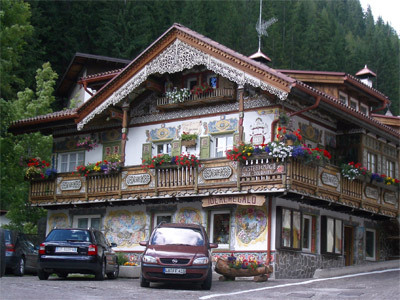 Rural Austria has the same Tyrolean culture as northeastern Italy, which does diminish the sense of loss in leaving Italy behind. Bike routes link Cortina and Austria making the riding easy going on that day of transitions. And prices dropped as we exited the tourist mecca of the Italian mountains and entered a less dazzling part of Austria, both in lodging and grocery store prices. But the instant cuisine change in the markets is always a shock to me as I wouldn't think that political boundaries should exert the potent effect that they do on food. We were just a few miles into Austria and jarred potato salad appeared on the market shelves and the quality of pasta dropped. The Italian nectarines on special in Austria were about 25% cheaper than the Italian nectarines in Italy. Mediterranean-styled canned eggplant that we didn't see in northern Italy suddenly was available for a taste treat in Austria. Yes, there is some blurring of food traditions in the markets close to the borders but it is still a startling shift in product lines and prices. The last pass Bill had wanted to do in 2003 was Kartitscher Sattel just across the border in Austria. At about 5,000' above sea level and with only 1500' of gain from our first overnight stop in Italy, it would be a relatively easy pass. The one section shown on the map as 13% grade was the only real bug-a-boo so we headed out under gray skies to take care of this bit of unfinished business. We were extremely lucky as the day's forecasted rain didn't hit until we crested the pass and Bill snapped a few photos of wild flowers in the first sprinkles. We bundled up in our rain gear and headed out for the descent which the map indicated would have a stretch of 17% down grade. But it was the strangest descent down a mountain pass we'd ever done as it was a seemingly endless series of up and downs, with too many 10-15% up's. After hours of exhausting riding, we hung it up for the day at a small and chilly guest house. We'd only managed to drop down to about 3,200' and we had accumulated as much elevation gain going down off the pass as we'd done on the climb up to the pass. We were both incredibly pleased that we hadn't done this pass in 2003 when I was pooped. It would have been easy to say "Yes" to one more pass, thinking the climbing was over when we reached the top. Instead, the series of short, steep climbs would have been my undoing. We've learned before and were again reminded that it is much harder to do a series of short, steep climbs than 1 sustained climb as our bodies never get into the groove. And even on this day when we were pretty well rested, the repetitions were making us cranky. It was especially difficult as we knew that a few miles over the ridge was effortless, gentle downhill riding along a well groomed bike route on the Drau River. We'd done the pleasant ride twice before and so had opted for some different views on this other route, but different wasn't looking so good now. Our road finally flattened out and we had a more civilized ride along the Gail River bike route the next day. We had a few looks at peaks on the fringe of the Dolomite cluster during breaks in the stormy weather but the mountains were no longer the focus of the day. Instead, we made an unexpected stop at a WWI museum in the small river town of Kötschach-Mauthen. Our 45 minute wait for it to open was surprisingly well rewarded as this thoughtfully done exhibit was accompanied by a hefty notebook explaining each of the more than 200 displays in English. Once we got into it, we regretted not renting the audio guide. 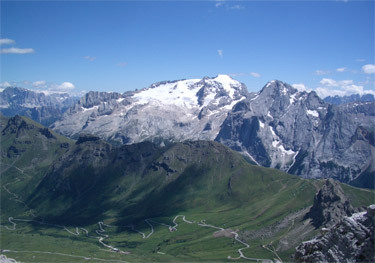 The Marmolata glacier from the Italian side. We knew from prior visits in the Dolomites that this was an active battle area between Austro-Hungary and Italy from the very beginning of WWI in 1914. Up at Passo Falzarego in 2003 we had poked our noses in one of the many tunnels built during the war and read small pieces about the battles. But this Austrian museum, which is only a few miles from the front line, amplified our understanding. The exhibit text commented that at Isonzo, one of the big battle areas, the Austro-Hungarians repeatedly had artillery defensive fire-power equal to that of the atomic bomb dropped on Hiroshima decades later. We were also stunned to learn that the glacier on Marmolata that we had admired for several days had miles of tunnels built through it for supply lines to the front and included barracks for hundreds of men. And we were again reminded that in the winters more men died from avalanches and life in the snow than from armed conflict. The museum is an offshoot of an effort begun in the 1970's to reconstruct trails used during the war and to construct cabins, shelters and open air museums in the battle areas. They have built over 200 miles of "Paths of Peace" that can be explored--paths that were trails used during the war. For more information about this project, go to the "Country Details" sidebar on our website homepage and look under "Austria" in the "Country Details" file (or click on this link Austria). The unplanned museum visit consumed our morning and the easy going day also had an unexpected break for picking strawberries during a break in the showers. At $1 for 2 pounds, we couldn't resist (and the friendly owner couldn't resist having her kids in the photo). U-Pick strawberries between rain showers. As we dropped to lower and lower elevations, the familiar larch trees were joined with trees we hadn't noticed since leaving the UK last winter. Bill whipped out the tree field guides so we could brush up on differentiating hazels, alders, and elms. Along the Drau River, which we eventually joined, we spotted English oaks and were surprised that the juniper looked so different than those I remember back home. Weeks ago the roadside corn crops were knee-high and now we could barely see over the tops of the stalks from our bikes. 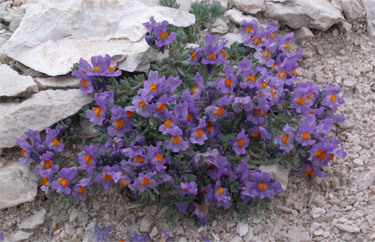 Both little purple and orange butterflies were out in numbers and we heard many more birds than we ever saw. The Austrian valleys had a lot to entertain us but without the drama of the mountain peaks. We caught a report on CNN-Europe about a public opinion study in Europe--one assessing how Europeans feel about America these days. Though pleasantly surprised to hear that not everyone hates America (especially after the Iraq war), we were chagrined to hear that the majority of the people who have a positive opinion about us are the least educated people and those in the lowest socio-economic groups. We've just arrived in Istanbul, taking a ferry the last miles to avoid freeway traffic. We have reservations for 8 nights and will be visiting with former Oregonians in town for a few days with a tour group. After that the plan has been to head down under to Australia and New Zealand but we've gotten stalled out. Having to pack the bikes, unexpected weight restrictions, the 25-30 hour travel time, the inevitable jet lag and the daunting task of tackling a new continent have bogged us down. Time to regroup and brainstorm. We'll let you know when we know what we are doing next and when.